These were made for a farewell party. I also made 36 mini cupcakes in the same flavours. Cupcake flavour is my signature vanilla, topped off with two of my most popular flavoured buttercream icings and decorated with large sugar flowers - so cute! Getting packed into my cupcake courier - I love seeing so many cupcakes all looking alike! Chocolate on top, vanilla underneath - ready to go! A big thank you to Perth Shoegirl (Vogue Forums) for this yummy recipe! Beat cream cheese and butter til smooth, add icing sugar and beat for 2 minutes; then you add the teaspoon of hot water. Beat cream cheese and butter til smooth, add icing sugar and beat for 2 minutes. Refrigerate for at least 1 hour. 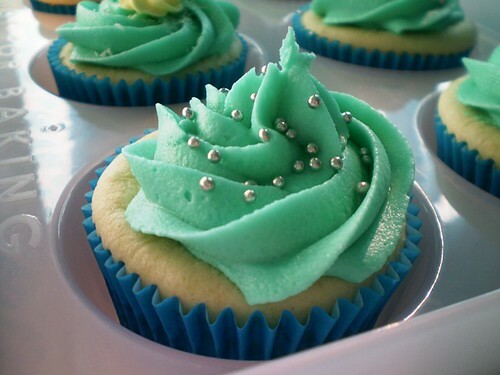 Coconut and vanilla cupcakes, topped with a delicious lime buttercream and sprinkled with shredded coconut. Topped with mini silver cachous - I love decorating with these! 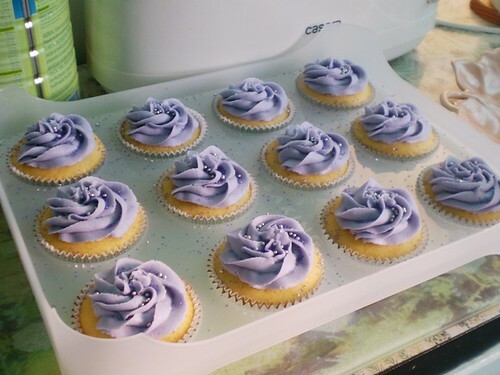 Updating will be a little slow as I don't have as much time on my hands anymore, but I have a couple of birthdays coming up so I'll hopefully be baking some more yummy treats soon! Vanilla cupcakes with chocolate buttercream and mini M&Ms - they smelt divine! 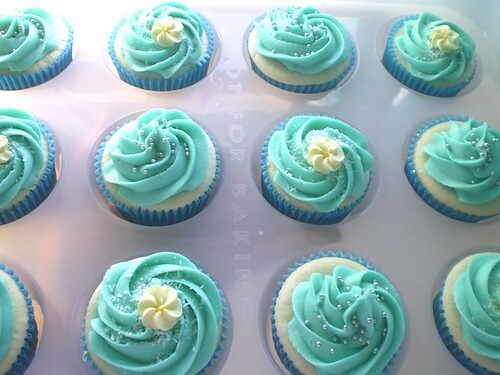 Sorry for the lack of updates - we've had workmen in our house replacing flooring and re-carpeting, and I'm now 36 weeks pregnant so I haven't had much time to make cupcakes. The bottom layer is Betty Crocker Devil's Food chocolate cake, and the top layer is Betty Crocker vanilla cake (tinted bright Lego colours - red, blue, green and yellow). The frosting is 2 sachets of Betty Crocker chocolate frosting, with about 3 cups of icing sugar and some light cream added - it's delicious!! I attempted my first ever 3D figures using fondant today - little baby boys! I love the look of the coconut cupcakes sneaking in the frame on the left - yummy! 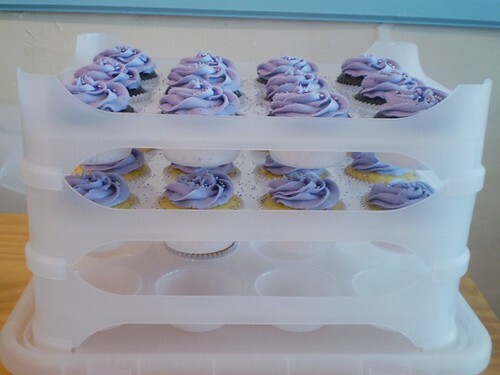 Cook your cupcakes and allow them to cool completely (best if the tops of the cupcakes don't rise over the top of the cupcake case line). 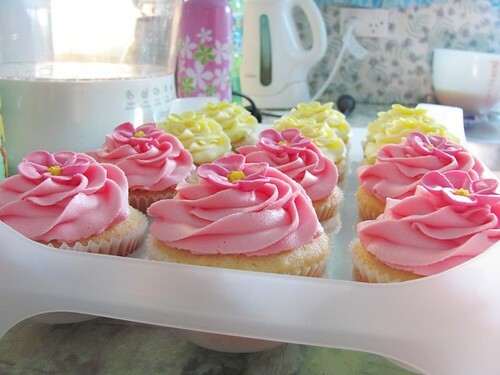 Divide the butter icing into two bowls, and tint one Pink and the other Rose. Using a butter knife place a good size blob of Pink icing in the middle of your cupcake, and then slowly spread it from the centre out to the edges. After each spread wipe the excess icing off the knife back into the bowl. Spread it nice and flat and make sure you spread it gently into the ruffles of the cupcake cases so you cannot see any of the cupcake underneath. 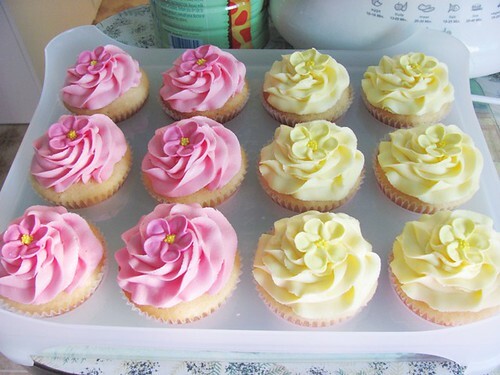 Fill your piping bag with the Rose icing and slowly pipe a small swirl in the middle of each cupcake using the 2D tip. Pop a silver ball on top of each swirl, and place two leaves at the base. TAH DAH! 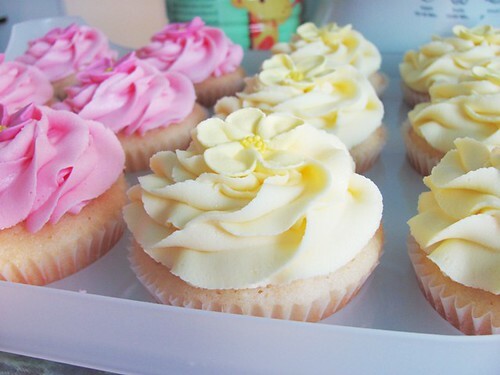 Now you have a pretty little rose cupcake :) You can change the colour from pink to any colour you like. How yummy does this look?? I made a simple vanilla cake batter (from scratch :O ) and divided it into 5 little bowls to colour. This is my favourite photo :) I love how vibrant the colours turned out! The colours I used are Rose Pink, Sky Blue, Kelly Green, Golden Yellow and Violet. Wilton piping tips 18, 1A, 8B, 1, 3, and 224; Wilton colour pastes Rose, Rose Petal and Sky Blue; 2mm silver cachous (so pretty! ); and a FMM alphabet cutter set. I'm not that impressed with the alphabet cutter set - I wish I'd purchased a metal cutter set instead, but I'll give it a go. I'm a stay at home single mum on a journey of self discovery, and I'm thoroughly enjoying myself in the process.